Vegas was crazy, and while we regaled with a few stories on this week’s Brainstorm Brewery, the craziness and great time that was had in Vegas is not the focus of this week’s article. After all, with so much financially-relevant happenings going down, how could it be? A few weeks ago I wrote about my thoughts regarding the initial price movements of Modern Masters 2015, with the promise to revisit those conclusions as more data became available. We now have some of that data, so this week I’ll be looking back at my initial conclusions and seeing what has changed since then. There were more than 88,000 Modern Masters 2015 packs opened across the world last weekend, with many more coming in side events (which I went 2-for-2 on this weekend, yay!). All told, that’s a lot of Tarmogoyfs. And while many expected that to be good enough to crater prices, reality doesn’t seem to be lining up with that. At this point most of the product that was opened in Vegas or elsewhere has been processed by the stores that bought it on-site (and most players were selling the valuable cards they opened so they could go gamble), so we are at or nearing peak supply. In fact, given that some notable cards have already begun to rebound price-wise, we may even be past that point. With Grand Prix Charlotte coming up next week (I’ll be there working coverage, so come say hi! ), we’re going to see continued demand for those cards opened in Vegas. But before I get into specifics, what are we seeing with the set, and format, as a whole? A quick look over the set shows that things are down sharply from a week ago, even if a few Mythics are bucking that trend. 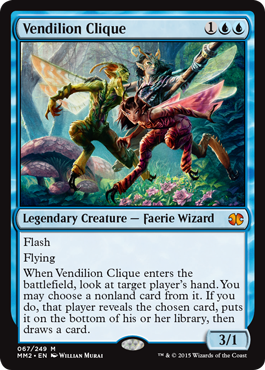 Sure, Mox Opal, Tarmogoyf and Vendilion Clique already seem to be bottoming out, plenty of other cards are still falling. Even Cryptic Command, Kiki-Jiki and the mighty Eldrazi aren’t done falling. So, for all the talk of peak supply and a bottom, there is at least some evidence to the contrary. But on the other hand, there are those that present the opposite of this trend. Tarmogoyf is of course the main offender (and we’ll get to that in a bit), but other highly-playable cards at Mythic and Rare are already beginning to flatline or rebound slightly. Mox Opal, Clique, Noble Hierarch, Spellskite and Karn are all showing, at the least, a steadying of prices. Notice the trend there? The highly-playable, truly A+ staple cards are holding up against the reprinting. Everything else that held a big price tag at least in part to short supply based on print run is really dropping. Wilt-Leaf Liege, Elesh Norn, Daybreak Coronet, Leyline of Sanctity and more are all still dropping, as we originally expected with the large influx of new supply. What does this mean moving forward? 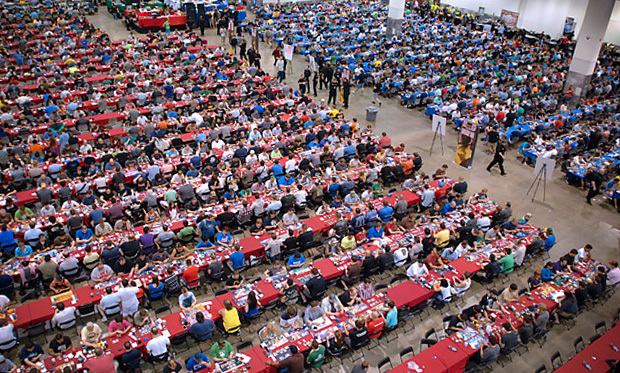 It means that Modern Masters 2015 is doing exactly what Wizards of the Coast intended it to do. 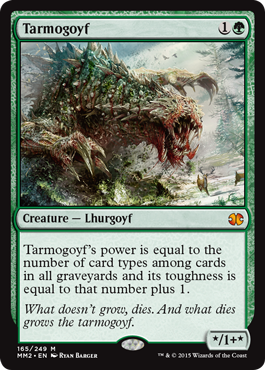 No, your Tarmogoyfs aren’t going to be $50 anytime soon. But you’re also not going to be shelling out $100 for a super-niche card like Coronet that was only expensive because of its laughably-small print run however many years ago. I suspect the drop on these “Tier 2” cards will continue, and we’ll see them settle lower in the coming weeks and months. The best of the best, though? I doubt we see much downward movement in that. Grand Prix Charlotte coming up will do a little to buoy prices, though it’s possible we’ll see some more leveling out after that, similar to how Richmond went the last time around. After Charlotte, Modern won’t be on the minds of most people until we hit Modern PPTQ season and Grand Prix Oklahoma City in September. High-end staples are bottomed out, and slow, incremental growth will likely return. “Tier 2” cards will continue to slowly fall over the coming month before leveling out and likely staying flat for months to come. Casual stuff, like Creakwood Liege, is being destroyed, and will take at least two years to come back, if Doubling Season is any indication. Time to get more specific. Let’s start with Dark Confidant. Formerly the gold standard of both Modern and Legacy and a huge status piece, we’ve seen Bob fall from that lofty heights. And he’s fallen hard. While Maher is still the third-most expensive card in the set, we’re talking about a card that was pushing $100 at its height. 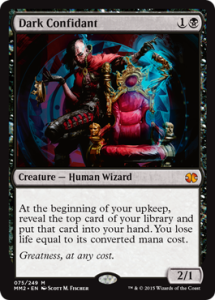 While Siege Rhino has done a number to push this guy out of the format, I’m not sold on his death quite yet, even if a field full of Affinity and Burn isn’t the ideal world for this guy. Still, this thing has halved in price, whereas buddy Tarmogoyf has seen just a 25% reduction, even if we’re generous with the numbers. I don’t see a super-bright future for Dark Confidant at this moment, but if he continues to fall we may see an opportunity here. I’m not dying to buy in at $45, but if this thing starts to push $30 I like it as a pickup. This may not be in flavor now, but a metagame shift could bring Bob right back to the forefront. The little Faerie that could. What’s interesting is that this may actually see more play in Legacy than Modern. Either way, the price here seems to have bottomed out, and I expect this to float around $45-50 for a while to come. Finally, we come to it. Here’s what I wrote two weeks ago concerning where I saw the Goyf heading. Before I go any further, there’s something I want to address specifically regarding Tarmogoyf. I know we look at the market as some elusive figure that can be predicted but never controlled. And while in most cases that’s true, it’s not always that way. Take, for example, Grand Prix Las Vegas and Tarmogoyf. Before the event we saw Goyf dropping toward $150 with momentum to go below there. Then the event starts and one dealer is paying significantly higher on Tarmogoyf than anyone else. Their price? $130 cash. That’ll put the stops on $150 retail Goyfs pretty quickly. Everyone else raised their buy price to at least compete, and because of that you saw an average buy price on Goyf $10-20 higher than it likely would have been if not for the decision that dealer made to put their money into Tarmogoyfs. The effect was felt. Instead of a falling Tarmogoyf price we have one that rebounded to $160 thanks to dealer actions, just like last time. Considering Tarmogoyf was retailing at $190-$200 before the reprint, this also leaves my prediction two weeks ago pretty spot-on. We’re done seeing Goyf majorly fall at this point, and even if it trends down to $150 I sincerely doubt it’s headed much further below that any time soon. So where will the final price be? I don’t think it’s going to brush off the reprint and be $200 again in a month, but I think $150-175 will be where it oscillates over the next year. 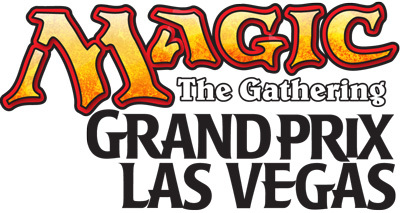 As I wrote two weeks ago, I would absolutely not be surprised to see it back at the same $200 mark by the time we’re writing about Grand Prix Vegas 3.0 and Modern Masters 2017. Modern Masters 2015 is now officially behind us, and while I’m sure there will still be plenty of drafts over the coming weeks, it’s time to look elsewhere. Grand Prix Charlotte next week will be the best place to begin to do that, and Modern has certainly proven itself to be a fairly open format at this point, something I plan to address ahead of the event next week. 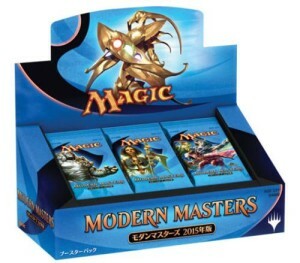 I’m not confident at all about the MM15 version going up from its $10 price. But do you think there is a chance that Foil MM15 versions go up? Do you think that “casual” demand will drive the price of SHM versions higher, especially SHM foils? I was already able to take advantage of an SHM Foil priced at MM15 foil prices as well as a couple of Non-Foils. I’ve found that a lot of “casual” players would much rather have the original foil version than a reprint. Would you consider it a “good” move to pick up the SHM versions and Foils based on their increased demand from casual players? Or would you stay away from all versions of this card? I’m definitely not an expert on Ebay, but in general I would stay away from all versions. It’s okay but not insane in EDH, which is what really drives foil prices. Casual players (re: kitchen table) typically don’t go for foils, as something like Glimpse the Unthinkable shows us.